Fight 7 – the rematch! So far in my professional career, I have only lost once, in a fight I knew I could have won. Unfortunately when I first arrived, I just wanted to fight and train and continue on until my shins wouldn’t let me. What I hadn’t considered was the mental struggle I would face if I didn’t take enough time to rest in between fights. By the time I fought Tainã, I had gone back to back fights (ordinarily not a problem) with only a days rest after each of my fights and it was my third fight training in this fashion. I knew I was really forcing myself to train and in the end I paid the price for it. I have been waiting for this rematch for months. Originally this was scheduled for the end of March but it was when I fell horribly ill and due to competing schedules, it took us a few months to find each other again! The cherry on the cake for this fight night was fighting alongside Kru Nai. 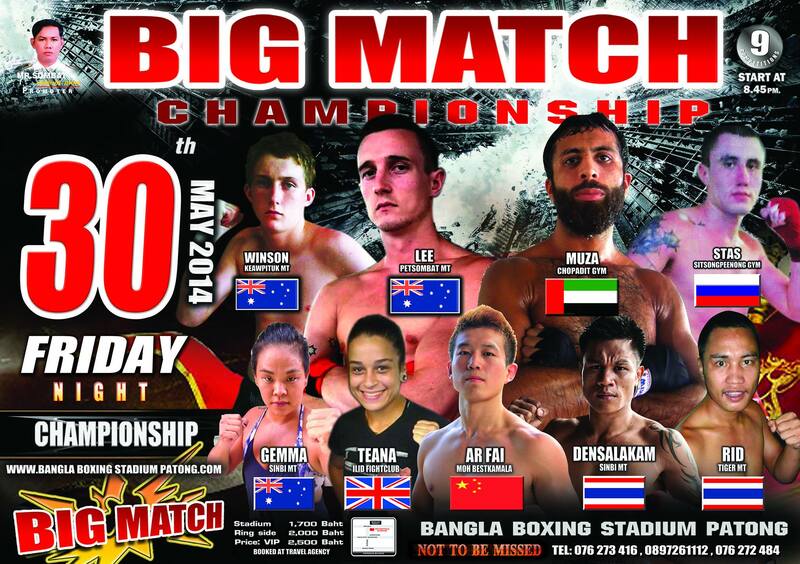 Kru Nai trained me in my trainer Sak’s absence and he is always spectacular to watch in the ring 🙂 I think we’ve decided we’re good fighting on the same cards as each other – 3 fights on the same night – 6 wins combined! 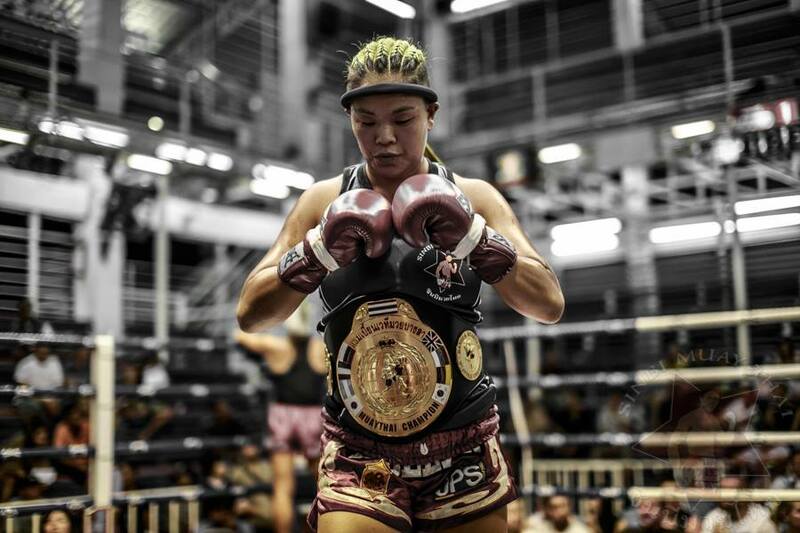 The prep for this fight was exceptionally difficult as I had been struggling with a deep seeded chesty cough which was preventing me from being able to breathe properly when hitting pads – it also meant that I was staying away from clinch work in order to not make the other girls sick. Despite a round of antibiotics and many other random Thai drugs, my chest was not clearing and I was beginning to feel some genuine concern for my fitness levels. To top this off, I was also unable to kick pads left leg due to injuring my ankle in my previous fight. After a rest day on the Sunday and a reasonably good day on the Monday leading into my fight, I went into some heavy clinching where my left ankle was swept and I was left unable to walk properly. After losing to Tainã and then pulling out previously I said I still wanted to fight – I was determined and even though it felt like the universe was against me, that I was going to fight and I was going to win. The Tuesday and Wednesday of my fight consisted of boxing only – no running – no sparring – no clinching. Fortunately my cough was beginning to subside and I felt very strong in my boxing fitness which inspired a little confidence in my final days. Once I had stopped training and began my rest days – it dawned on me. I was freaking nervous! I don’t remember the last time I felt nervous this far before a fight. 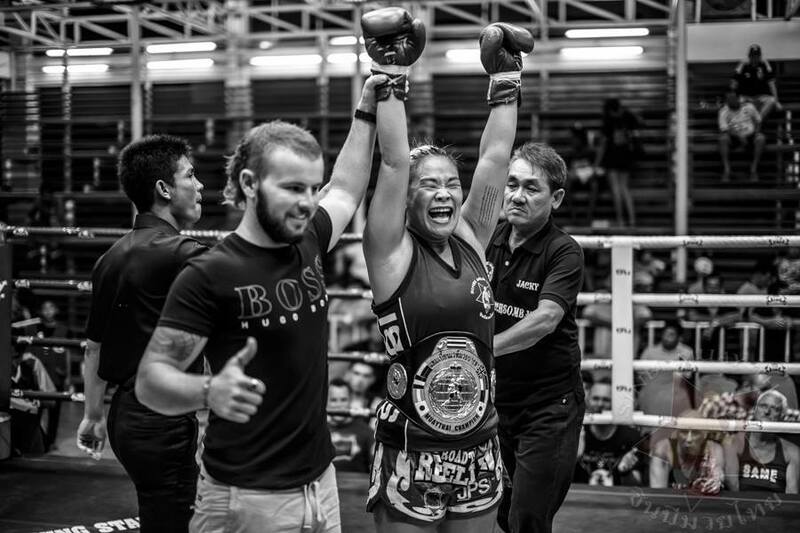 Sometimes when I am waiting my turn ringside, I will get a few butterflies – the ones that go away when I reminded myself how lucky I am to be here doing what I am doing and how much I LOVE Muay Thai. Being nervous days before a fight though? I don’t like it! 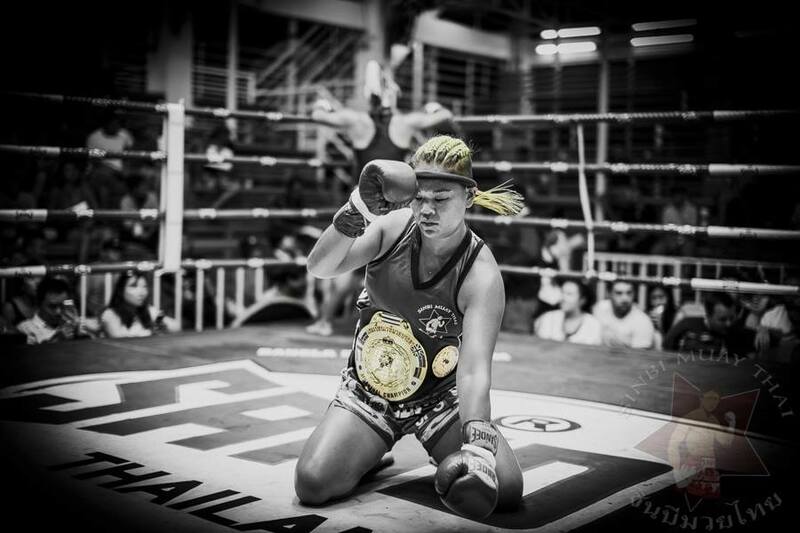 Tainã was a World Champion in K1 back in 2010 and she beat me by out doing me with leg kicks in our first fight. Some of my nerves came from knowing she would be a fit tough opponent, but I was confident I could beat her in the clinch, despite my ankle problems. 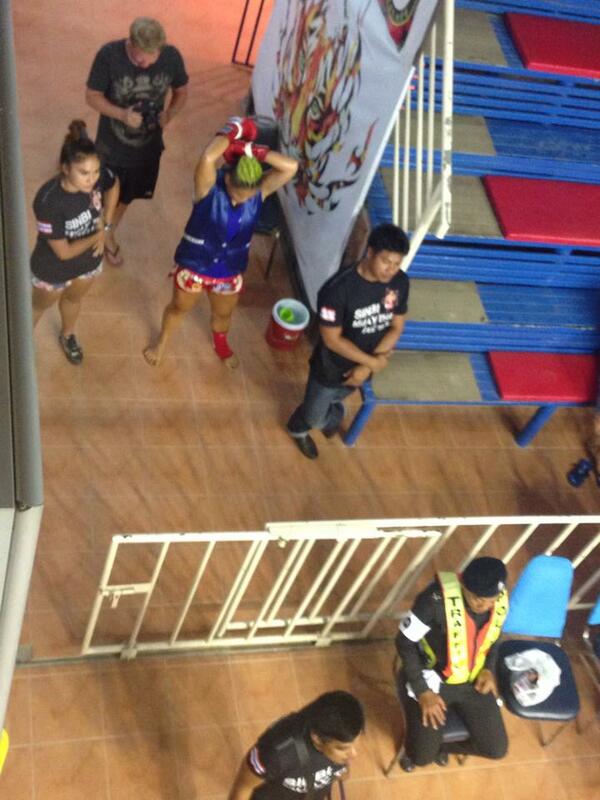 When I spotted Tainã at the stadium, I could see how determined she looked. It’s both a blessing and a curse that we have our fights posted online because it’s easy for our opponents to track our progress. Regardless, she took the fight, so she must have also felt confident that she could walk away with the win. Protecting my belt was fun – but awkward – I had to do my Wai Kru Ram Muay in the belt which was interesting. I made my Wai Kru shorter just so I wasn’t struggling around the ring with it on! Round 1 started as it always does – slow and calculated. Watching to look for any new moves and improvements on old ones. My biggest concern was her low kicks. Rounds 2 and 3 progress and I am having a hard time getting into the clinch with her. She is beginning to out strike me and I am far from elbow range. It was a very frustrating few rounds because she was still so fresh and was moving quicker than I was. The few times I manage to get into the clinch with her she immediately put us in a position where the referee came and stopped us. I noticed that her clinching had gotten much better and she was getting some nice power behind her knees. A skill she had not yet mastered (and neither had I) in our first match. About a second before the end of round 3 she threw a knee right into my solar plexus. I have never, in my entire life, been so happy to hear a bell go off. I knew I was hurt and it was the first time this year someone has really damaged me during a fight. After re-couping, I knew I had to push harder – the second I could clinch I had to throw knees. No hesitations. It was such a calculated process because she was locking me around the body which means she could have swept me at any point if I was not careful. The fine line between remaining active enough to continue the clinch and throw enough knees, without getting swept! I was on the hunt. I threw a nice right kick and noticed that it really took the wind out of her sails. After that, I knew I had her beat. I continued to hunt her around the ring until I noticed my corner frantically yelling at me to stop fighting. I had won! If you watch the video below you can see the boss running around the ring trying to get my attention and you can hear the corner yelling at me to stop fighting. Sorry guys! I thought it was the crowd cheering for me!!!! This has been my most technical fight to date and I was so grateful for the opportunity to redeem myself. I am finally in a really good rhythm with life and training and it’s nice to be having all my hard work pay off. Bring on another belt defence and my next fight! An enormous thank you to my sponsors – Pure Energy – for all the incredible clean food you provide me with – Elite Combat Nutrition – I’m not skinny yet but I will be soon – and of course Absolute MMA – you guys gave me my start in fight world and your continued support from afar is just so incredible to me. ← All of the noms!! !